By the time she was in the fifth grade, Cyndi Ryland was 5 feet 10 inches tall, a sequoia among saplings. At an age when most of us would have done anything to shrink into the crowd, Ryland couldn’t. In fact, she realized that she liked being different. 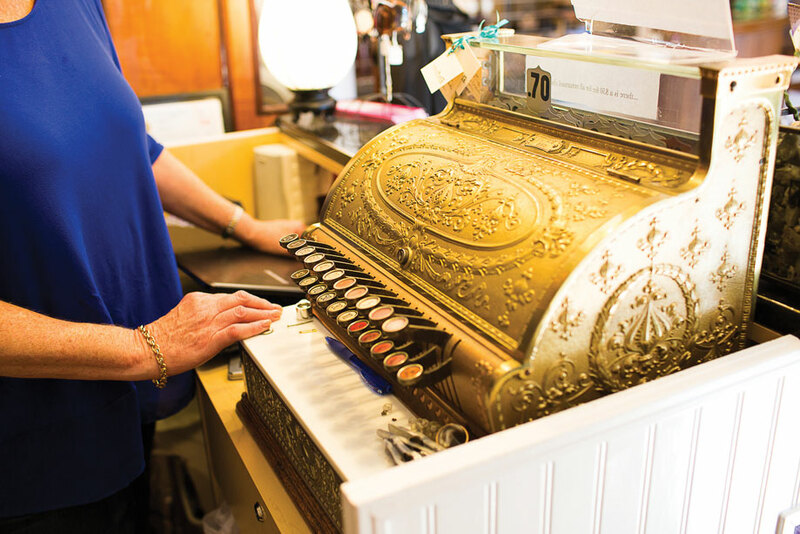 Spending time with a neighbor who had an antique business, she quickly knew that the malls of North Jersey were not for her. She had discovered a world of vintage fashion, a world of beautiful clothes that had elegance and grace and a touch of cool. That was the world in which she wanted to live and there was no turning back. After almost 21 years of buying, selling, and refining her taste, Ryland remains passionate and driven about that world. 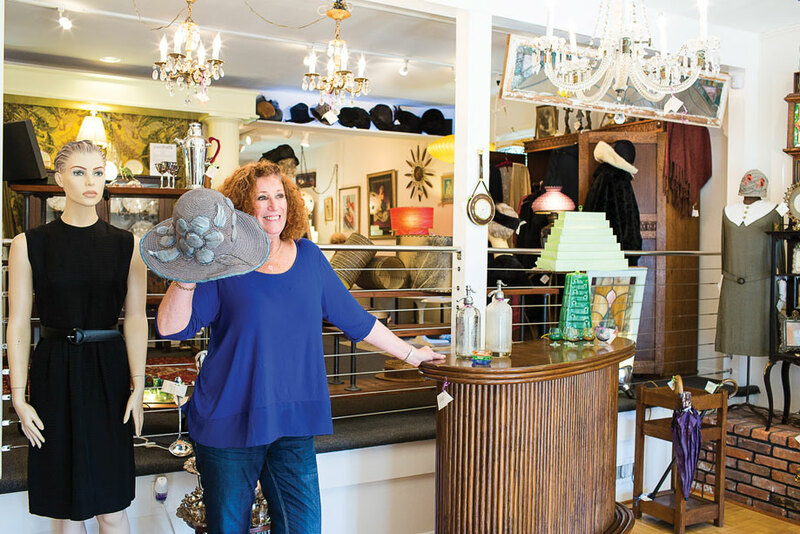 Luckily for us, she moved Retropolitan, the fabulous vintage clothing and antique shop she owns with her daughter Caitlin, from Ellicott City to West Annapolis two years ago. When you walk into Retropolitan, it might take a few minutes to “get” what is going on. It is this. In Ryland’s words, “fashion is not just what we wear, but what we surround ourselves with.” The clothes and the antiques belong together. They are of the same eras, generally early to mid-20th century. You can find yourself the perfect outfit, right down to shoes and hat, slip into the changing room, come out a little more elegant, glide across the room, seat yourself on the red and white vinyl 1950s jackknife sofa (yes vinyl… “better living through chemistry” is a bit of a theme here), light up a Lucky and get ready to pitch a fabulous idea to Mr. Draper. If your pulse quickens a little too much at the whiff of mid-century, you would be wise to down a couple of martinis before walking in and spotting what has to be the best Heywood Wakefield piece ever. The dressing table is all angles and mirror, almost an optical illusion. It dances and makes every other Wakefield you’ve seen look anemic. Turn around and you are drawn like a moth to the iconic and pristine George Nelson Bubble Lamp, another nod to the marriage of petrochemicals and great design. Peer inside and you will spy the slightly yellowed Howard Miller and Company paper label attesting to its 1950s pedigree. Imagine if, like Ryland, you’ve studied French in college and have spent much of your adult life as a French teacher. You don’t want your French to get rusty, so you’d better get yourself to Paris as often as you can. And if you’re in Paris and you have a little time to kill, you might decide to learn a little bit about vintage French lighting fixtures—just enough so you can have a Parisian dealer lead you down a cobblestoned street in an outer arrondissement, past an old concierge and up a stairway wrapped around a courtyard, into a flat that has been stripped bare except for its rare and majestic 1930s Ezan chandelier (which even the Parisian has not correctly identified, but which you just know is exactly that). Soon after, you’re on a rickety ladder gingerly lowering this light, which is anything but light, to the Parisian and your husband, who reluctantly agrees to give up his parka (he really is a good sport) to swaddle this stunning piece of Art Deco that quickens your pulse with its modern-machined elegance and its irreplaceable glass shades faintly tinted with cobalt and its original crystal rods. And which has necessitated a not insubstantial transfer of family assets to the Parisian, and which is soon to be carried down the stairs by the good sport, who has just realized that he will be hauling this piece, which somehow won’t fit in a taxi, for several kilometers through the cold, gray February day to another Parisian who will pack it and ship it back to Maryland, where it can be hung in Retropolitan and elicit a slight gasp from a local magazine writer who instantly and vividly remembers sitting under a chandelier-perhaps an Ezan, in a Montparnasse brasserie surrounded by Parisians who can never be anything but fashionable and beautiful and whose style and food satisfies every hunger, only more so. It is a light fixture to build your life around. There are so many vintage hats here, fedoras and the like, lining the shelves that you can almost taste the crispy sizzling pork bellies nestled on beds of organic micro-greens, about to be devoured by crowds of hungry Brooklyn hipsters. The dresses recall Lauren Bacall leaning against a wall, the glamorous cut of her long perfectly-tailored dress showing us all what is elegant and graceful and beautiful about the fashions that Ryland has spent the past 21 years collecting and selling. You may get a sense that you are walking down the boardwalk in 1920s Atlantic City, the thrill of the jazz age and the edginess of violence stoked by a thirst that Prohibition won’t quench. This era comes alive at Retropolitan, a world of perfectly preserved flapper dresses and men’s bathing suits that left everything to the imagination. Ryland’s eye is so good and her collection so strong that when HBO needed to dress the cast of Boardwalk Empire they turned to Ryland, and UPS did a brisk business hauling Retropolitan clothing to the New York soundstage. For all of Ryland’s passion and drive she can’t help but smile when she tells you about the fashion director who called from the set to tell her that he was sending back those men’s pants because didn’t she remember that the scene was set in 1923, and of course that button on the waist wasn’t introduced until 1927? She knew that she had met her match. Error: Error validating access token: Session has expired on Saturday, 09-Mar-19 15:57:50 PST. The current time is Tuesday, 23-Apr-19 09:11:08 PDT.